Renz has created three shows to date, each with its own distinct style and material, however, they do share a few common traits - they are each written with a single theme in mind and they are all performed for small audiences of no more than 60 to create an intimacy and ensure everyone can see closely. The shows are called 'Burn Witch Burn', 'Mystic' and 'Poet of the Impossible'. Whatever he does, the audience is engrossed and the final few seconds are almost a miracle! Subtle and quick Novani finishes his show in the most impactful way. As someone who frequently experiences sleep paralysis and lucid dreams - Renz has always had a special fascination with dreams and the levels of consciousness between sleep and waking so Renz initially created the show 'Spellbinder' themed on this. Later, he started to write spoken word poetry and wondered - could magic and spoken word complement each other in a LIVE performance about dreams. The answer seems to be 'yes'! ' - 'Poet of the Impossible' was born - a finely structured show which has impressed some of the most discerning observers and been invited from EdFringe to Brighton Fringe Festival, Carlisle Fringe and most recently Edinburgh Magic Fest, where it will be shown on 15th May in The Scottish Storytelling Centre. See 'Diary' for details. Click below for the 'Mystic' promotional video. 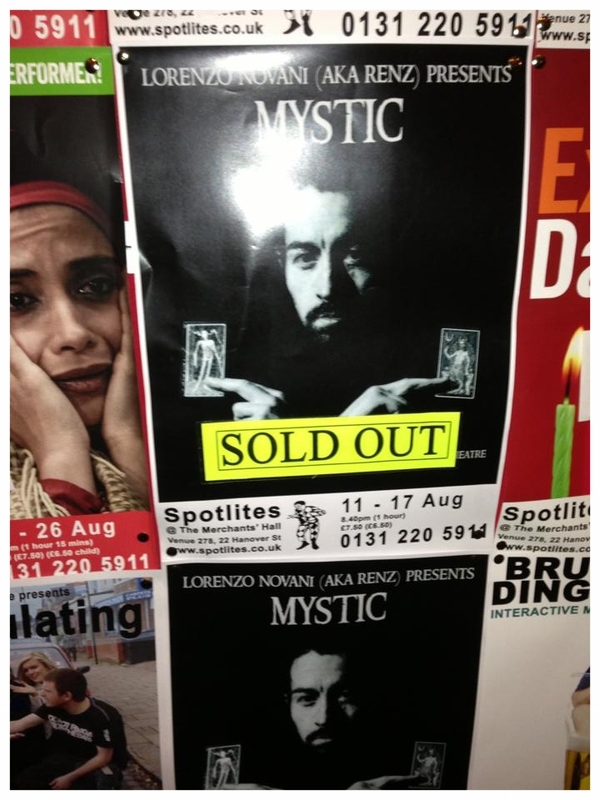 Mystic was originally performed at The Edinburgh Fringe Festival in the summer of 2013, however, you'll be able to catch it again in the near future. The show is inspired by people throughout time who have claimed the ability to see the future and is comprised almost entirely of mentalism effects. In preparation for the show Renz did research on enigmatic characters such as Rasputin and Nostradamus. Summer 2013 was glorious - the pictures below show Renz and some friends flyering and sunbathing (!) on The RoyalMile. Burn Witch Burn, Renz's first formal show, was set in the atmospheric, Cathedral House Hotel, next to Glasgows' Necropolis. The performance fused hypnotic language and dark storytelling to create a disconcerting atmosphere for the audience. The performance was created specifically as Hallo'ween entertainment for adults. STV Glasgow made a short preview of the performance and a story about the performance ran on the front page of The Evening Times (see bottom of the page). Click the button below for Renz's interview with STV on Burn Witch Burn and The Daily Records article on the performance.